In total we saw 210 bird species. As we had been to Sulawesi before, we mostly limited ourselves to areas not visited previously: Dumoga-Bone and Gunung Ambang, but revisited Tangkoko. The island of Halmahera was new to us and therefore we spent nearly half the time there. 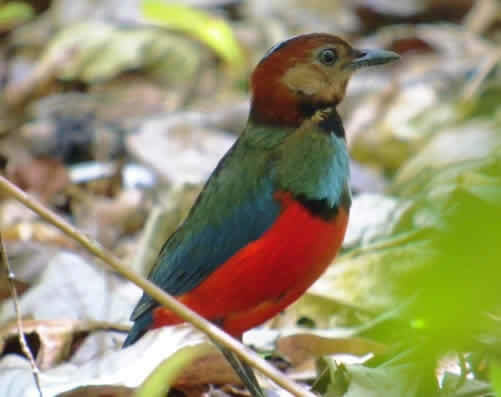 For us the top ten birds were: Spotted Harrier, Maleo, Moluccan Owlet-Nightjar, Great-billed -, Scaly – and Paradise Kingfishers, Purple Roller, Ivory-breasted and Red-bellied Pittas and Wallace’s Standard-wing Bird of Paradise. Though we missed quite a few specialties, esp. rails and owls, we regard the trip as a great success. We had the help of a travel agency and local guides in organizing transport and accommodation, but found most of the birds ourselves. The weather was hot and muggy with almost no rain. In retrospect we feel it would have been more productive to spent a day longer in Gunung Ambang and a day less in Tambun. Even though probably nearly all Halmahera species can be found in the Kali Batu Putih area near Sidangoli, a number of species were definitely much easier to find in Foli. The situation with Moluccan Scrubfowl is worrying. Clearly protective measures should be taken urgently. We met at Manado, Robert flying in from Phnom Penh and Nicolaas from Amsterdam. Liwayne Adventure Tour & Travel based in Manado arranged the trip to Dumoga-Bone, Gunung Ambang and later Tangkoko on Sulawesi. They also purchased our tickets to fly to Ternate. There we picked up the guide (Abdullah Iskandar) for Halmahera. When Nicolaas departed on 5 Oct., Robert stayed a few days more in the diving resort of Bunaken near Manado. In April 2001 we visited Sulawesi for the first time and concentrated mainly on Tangkoko and Lore Lindu. Nicolaas flew with Singapore Airways from Amsterdam to Singapore and onwards with Silk Air to Manado. Robert flew with Air Asia from Phnom Penh via Kuala Lumpur, where he had to spend the night, to Manado. For citizens of the EU a one month visa for Indonesia is obtainable at the airport for US$ 25. Nicolaas took a daily malaria pill (Malarone), but Robert did not and did not suffer any consequences. Only in Sidangoli on Halmahera we were once briefly harassed by the police, but otherwise we felt quite safe and people were friendly. One needs plenty of cash Rupiah as foreign currency is not widely accepted and –as far as we know- can only be changed in Manado. As we arrived on a Sunday, the airport banks were closed, but one money changer was open, obviously not offering the best rates. The exchange rate with the dollar has not changed very much over the past 8 years and is close to Rs.10,000 per 1 US$. Meter-taxi’s are available from the airport. We stayed in the Minahasa hotel in the center of town (a double room can be had for Rs 300,000 and includes breakfast). We met the first evening with Mr. Wiro of Liwayne Adventure Tour & Travel in Manado (info@sulawesi-lw-adventures.com) and settled the car rental arrangements (a small van with driver Jevon) and flight bookings. Car rental was Rs.500,000/day plus fuel and accommodation and food for the driver. These prices had been negotiated before arrival. The Lion Air flight from Manado to Ternate and back was Rs.1,540,000 per person. When organizing a trip oneself, it is important to negotiate (‘tawar’) and agree on prices of transport, food & accommodation, guiding fees, etc. before making use of them. We visited Tambun and Toraut (both in the Dumoga-Bone NP), but stayed at Tante Mien’s homestay in Dolodua (tel. 081523833505). It proved that Tante Mien provided us with the richest food (e.g. tuna steak!) we experienced during the trip. Dolodua is situated between Tambun and Toraut and is not far from the Molibagu road. After some ‘tawar’, we agreed on a price of Rs. 400,000 per day for food and lodging for the two of us (and our driver Jeff). We were guided by Max Weela (Rs.200,000/day), who works for the park. Max speaks English well and knows his birds. We also paid the park fees (Rs.21,000/day/person against receipt). However, in Toraut we had to pay an additional Rs.100,000/person/day for a ranger to accompany us and in Tambun Rs.50,000/day for the guard. We stayed in the house of Julius Runtunuwu (tel.081340095080), who is ranger of the Gunung Ambang Nature Reserve. The house is situated in Singsingon and about an hour’s walk from the start of the G.A. trail. Room rate was Rs.100,000/night and food was Rs.25,000/meal/person. The food was good and ample. The guiding fee was Rs.200,000 per day. Pak Julius does not speak English and knows only a few bird names, but is helpful in finding the key species. The altitude is between 1000-1400m and hence it is a bit cooler (and more pleasant) than at sea level. As in Tangkoko, there are mites on the forest paths and vegetation. They cause long-itching red bites on the legs and one can effectively protect oneself with Deet. Batu Putih is the village near the Tangkoko NP entrance. We stayed in the Tangkoko Ranger Homestay, where we had stayed in 2001 as well. We paid Rs.250,000 per night for a new room with 2 beds and food for 2 persons. We asked Pak Yunus, the park ranger, to accompany us as he had done in 2001. We were told the fee for birdwatchers is now Rs.250,000/full day/person and 150,000 for a half day, but includes the entrance fee - we did not receive a receipt though. We rented a palm boat one day for Rs.250,000. Transport back to Manado is easily arranged and costed Rs.250,000. Our guide for these two islands, Abdullah Iskandar (kamu_is@yahoo.com), lives in Ternate and runs his own environmental NGO. He was not available during Idul Fitri at the end of the Ramadan. His English is rather poor and he is not very good at locating birds for customers, but he knows the sites and is helpful in organizing the logistics. We paid him Rs.250,000/day plus food and accommodation. In Sidangoli we rented a car with driver Walee for Rs. 500,000/day, fuel included. We stayed in the Sidangoli Indah hotel and managed to get the only air-conditioned room available. The rate was Rs.160,000, which is double that of the other rooms, but was well worth the extra money, as it was hot and sticky even at night. The main tarmac road from Sidangoli to Tobelo runs through the Kali Batu Putih (KBP) hills. The logging road and km 12 path are side roads of the main road. From Sidangoli to the start of the logging road is about 8 km and the km 12 path is obviously 4 km further on. The transmigration village Desa Binagara is on a partially paved side road of the Sidangoli-Tobelo road. Where the tarmac stops and the gravel starts, is Gunung Mamin. Here we saw the Purple Dollarbird high up on the slope near the road. In KBP there is a Wallace’s Standard-wing lek in a part of the forest that is owned by Anu. In order to visit the lek one has to depart from Anu’s house by about 4 am, as it takes about 2 hours to walk to the lek through the forest and crossing some streams in the dark. The birds become active well before daylight at 6 am, but their activity decreases strongly after 7 am. Anu guided us that day (Rs.500,000) and charges an additional fee of Rs.250,000 for the privilege to visit the lek. It is possible to use another –cheaper – guide, a relative of Anu. It also is possible to spend the night at Anu’s house. One morning we rented a palm boat (Rs.150,000 for 2 hrs.) to take us to the seaside of the mangrove island in front of the Sidangoli harbor, where we found the Beach Kingfisher and also Grey-tailed Tattler. Daru lies on the Sidangoli-Tobelo road and has a small landing site from where one can cross a sea arm to Foli. The only accommodation available at Foli is the house of the village chief. It is best to check availability in advance. Upon request the headman will also send a palm boat (canoe with outriggers) across to pick you up from Daru (Rs.200,000). The crossing takes about 1.5 hours and if carried out later in the day, can be a wet experience. It is also advisable to wear earplugs, as the noise of the outboard is deafening. The first days we stayed at the house, there was a Birdquest group occupying the guest sleeping quarters and we were given in a room in the main house. We paid Rs.100,000/night/person for accommodation and Rs.75,000/day/person for food. The main birding area, a logging road, starts 3 km from the house and runs for at least another 7 km through partially logged forest. For transport motorcycles with driver can be hired for Rs.200,000/each for a full day. Nicolaas and Robert arrive in Manado. Stay in Minahasa hotel. Drive to Dolodua. Overnight at Tante Mien’s guesthouse. Tambun (Maleo) in morning; Toraut for owls in evening. Tambun early morning thereafter Molibagu road; Toraut end of afternoon. Tambun & Molibagu in morning; drive to Singsingon & owling in evening. Gunung Ambang all day, incl. owling in evening. G. Ambang early morning; travel to Manado & change money, etc. Flight Manado-Ternate; speedboat to Sidangoli on Halmahera. Kali Batu Putih logging road & km 12 forest path; owling in evening. KBP Standard-wing lek and logging road; owling in evening. Travel to Daru; palm boat to Foli; km 3-4 of logging road in afternoon. Foli: km 3-5 of logging road morning and again afternoon. Foli: km 7-9 of logging road morning and again afternoon + evening. Foli: km8-10 of logging road in morning. Km 3 in afternoon. Palm boat to Daru; drive via Lamee forest to Sidangoli. owling in evening. Early morning KBP km 12; boat trip along mangroves; owling in evening. Ferry from Sidangoli to Ternate; to Danau Tolire in afternoon. Flight Ternate-Manado; drive to Tangkoko; walk to Benteng resort. Sea trip by palm boat to mangrove areas. Tangkoko morning visit; afternoon drive to Manado. Departure Nicolaas Manado-Singapore-Amsterdam. Robert to Bunaken. Travel to Manado. Flight to Kuala Lumpur. A complete breakdown of species by site is given in the attached spreadsheet table. The main reason for visiting Tambun is to see the Maleo. The Wildlife Conservation Society (WCS) has set up a breeding enclosure here. Since the birds are well protected, numbers have been increasing. The site is not near a beach, but the soil in a small flat area is warm due to some volcanic activity. This relative open area is surrounded by forest. For extra protection the eggs are dug up and placed in the soil of a locked cage. When the chicks hatch, they are fully fledged and are released (often by visitors). There are quite a few other interesting species to be seen, such as e.g. Maroon-chinned Fruit-Dove. We visited the park’s HQ at Toraut mainly to see some owls and managed to find Ochre-bellied Boobook, Sulawesi Scops Owl and Speckled Boobook (the latter in an abandoned house in the main compound). Along the river behind the HQ Pied Cuckoo-shrikes are easy to find in the evening. The Molibagu road intersects the Dumoga-Bone park and climbs over a pass through forest on both sides. There is quite a bit of traffic. It is good for raptors, but our most interesting finds were a Sulawesi Dwarf Kingfisher and a tree full of Knobbed Hornbills. The species to see at GA is the Matinan Flycatcher, (which was described from this site), as well as Scaly Kingfisher and Cinnabar Boobook (Ninox ios), a recently described species. Unfortunately, we missed the latter one, despite trying the two evenings we were there, as well as one early morning. In retrospect, we should have spent more time in Gunung Ambang and less in Dumoga-Bone. The fields between Singsingon and the GA mountain are patrolled by Spotted Harriers. Red-eared Fruit-Dove, Red-backed Thrush, Chestnut-backed Warbler, and Spot-tailed Goshawk (male and female) were highlights in the forest. To our surprise we discovered an Elegant Pitta in the woodland near the entrance. Its status on Sulawesi is not clear, but it is likely a migrant here. Actually, we were looking for the resident Red-bellied Pitta, which we eventually found too. The Ruddy Kingfisher can still be seen somewhere along the park border stream. Green-backed and Lilac-cheeked Kingfishers are easily seen at this time of the year at least in comparison to April 2001, when we had difficulties finding them. In addition, we found a Sulawesi Goshawk, Red-backed Thrush and Isabelline Bush-hen, as well as many other species. We encountered roving groups of Crested Black Macaques (Macaca nigra) and at night one can see Spectral Tarsier (Tarsius spectrum). We rented a palm boat to go to the mangroves areas outside the park to look for Great-billed Kingfisher, where we managed to get glimpses of one. On a nearby mud bank was an Oriental Plover. On another afternoon we walked over to the Benteng resort, where we saw a Sulawesi Goshawk. Robert later saw a Great-billed Kingfisher again on Bunaken Island, on the seaward side of mangroves in front of the Bunaken Seagarden Beach Resort at low tide. As we had rented a car with driver, we birded the area on our own, except for the day we visited the Standard-wing lek guided by Anu (tel. 081356343793), who says he owns the area in which the lek is located and thereby can prevent logging. Walking through the forest in the dark produced some interesting encounters. First there was Spectacled Monarch sitting at eyelevel on a branch above the path, that did not stir while we shone our torches on it. Later we saw two Ivory-breasted Pittas sleeping in a small tree next to the path. At the lek the Standard-wing males started to perform well before it became light at 6 am and they stopped more or less at 7 am, probably because no female showed up. Some days later we found some Standard-wing males at the km 12 path as well. When coming from Sidangoli the logging road is to the left, but going instead to the right proved rewarding. The path does not go very far, but goes up a bit after crossing the stream and reaches forest. We saw there our first Ivory-breasted Pitta, as well as Eclectus and Red-cheeked parrots, Blyth Hornbills, White Cockatoo, Brush Cuckoo, etc. and soaring above the forest a Gurney’s Eagle. Along the logging road proper and its side tracks, we found Sombre Kingfisher, Goliath Coucal, etc. and after dark Moluccan Scops Owl and Moluccan Owlet-Nightjar. A small logging path higher up in the hills. Among others we found Paradise Crow, Dusky Scrubfowl, Chattering Lories, Wallace’s Standard-wing, White-Streaked Friarbird, Scarlet-breasted Fruit-Dove, Moluccan Goshawk, Cream-throated White-eye. We made this trip to find the Purple Dollarbird, which we eventually did on the way back, when we decided to stop at – what is called - Gunung Mamin (see also above) and scan the hillside more or less from the road. By then it was already late (11am) and hot. There were also some Long-billed Crows. Just past the Transmigation settlement (Desa Binagara) we saw among others Grey-headed Fruit-Dove and Cinnamon-bellied Imperial Pigeon. Common Dollarbirds were plentiful here. This rather degraded forest is on the road from Sidangoli to Tobelo. It is still worthwhile to stop there and walk a bit inside: Slaty Flycatcher, Blue-and-White Kingfisher, Violet-necked Lories, etc. More significant we saw here our only Common Paradise Kingfisher. Heard it KBP and Foli, but did not see it. We had heard that for Moluccan Scrubfowl there is an alternative site to the Galela one. A Mr. Robert of Desa Woisia (part of Tobelo) is the owner(?). We contacted him and he explained that due to the dry spell no birds had been seen for a while. This turned out to be also the case for Galela, as we heard later from a group birders that went there two days before we were in Tobelo. From what we heard it appears that the numbers of Moluccan Scrubfowl are very low and that habitat destruction and egg collection still continue. A protection scheme like the one set up for the Maleo in Tambun is urgently needed. In Daru we took a palm boat to cross to Foli. Before departure a group of Whiskered Treeswifts passed through the village and in the neighborhood we saw a Sugar Glider (Petaurus breviceps papuanus), a pretty marsupial squirrel. During the crossing not much was identified, as the boat is not stable, but we saw Bridled Terns, a Brown Booby and Red-necked Phalaropes. The logging road is the main venue for birding. It starts at km 3 from the village of Foli and runs for at least 20-30 km. However, the motorcycles will take you as far as km 7 or 8. The degraded forest along the road is rich in bird life. Red-flanked Lorikeets are particularly common. A Pacific Baza gave great views, as did White-naped and Spectacled Monarchs. At km 8.5 there is a forest pond, where we found Spotted Whistling-Ducks and at km 9 was a Flame-breasted Flowerpecker. This area is good for Fruit-Doves and Pigeons as well. In general Parrots, Pigeons and Cuckooshrikes were more readily observed at Foli than in Kali Batu Putih, but a telescope is essential. At the time of our visit a Drummer Rail was seen by a group of birders. Unfortunately, they did not tell us. We had one afternoon in Ternate and visited the impressive volcanic lake Danau Tolire at the foot of Ternate’s active volcano. 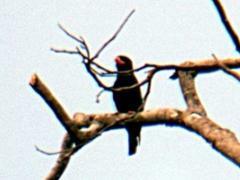 We took photographs of Great-billed Parrot and Blue-capped Fruit-Dove and saw among others Torresian Crow. A guide to the Birds of Wallacea by B.J. Coates, K.D. Bishop & D. Gardner. Dove Publications, 1997 (535 p.). A pocket Guide to Tangkoko-Duasudara Nature Reserve by Rob Lee, Jon Riley and Lefrandy Pesik. Wildlife Conservation Society (WCS), KOFFAS and the Department of Forestry. 61p. North Sulawesi: a natural history guide by Dr. Margaret Kinnaird of Wildlife Conservation Society (WCS) for the Wallacea Development Institute in Jakarta, 1995, 83p. Birdwatching Areas: Gunung Ambang Nature Reserve, North Sulawesi by Jon Riley. OBC Bulletin 32, p.56-58. Our thanks go to Mr. Wiro Mokili and Theo Enoch of Liwayne Adventure Tour & Travel in Manado (info@sulawesi-lw-adventures.com), who were helpful in organizing the Sulawesi part of our trip. We are also grateful to the contributors of the website www.xeno-canto.org, where many of the calls from the region can be found and to Matthias Fehlow and several other birders, who provided us with useful information.